Gilbert, AZ – Corey ‘The Boss’ Hosford formally announced his return to Formula DRIFT Pro2 competition today, having been absent from competitive driving in recent years. The “Boss” will also find support from his new sponsors at Rockstar Performance Garage, AEM Induction Systems, Street Standard, Vibrant Performance, Takata, Maximum Driftcast, Momo, Fueled Racing, Holley Performance Products, Turbo by Garrett, Nexen Tire, Mishimoto, R1 Concepts, Tial, Motegi Racing, KW Suspensions, Blackworks Racing, Aeromotive Fuel Systems, Wisefab, AutoMeter, Exedy Clutches, Mast Motorsports, K1, Pandem by Tra Kyoto and many more. Bridges Racing in Huntington Beach, CA will facilitate the final completion of the number ‘232’ Nissan 240SX S14, while adding a custom Mast Motorsports Black Label 427ci V8 motor with TWIN GTX3582 Turbo by Garrett turbos breathing 14psi; among many other mods. “This should put us near the 1K horsepower mark when track ready. 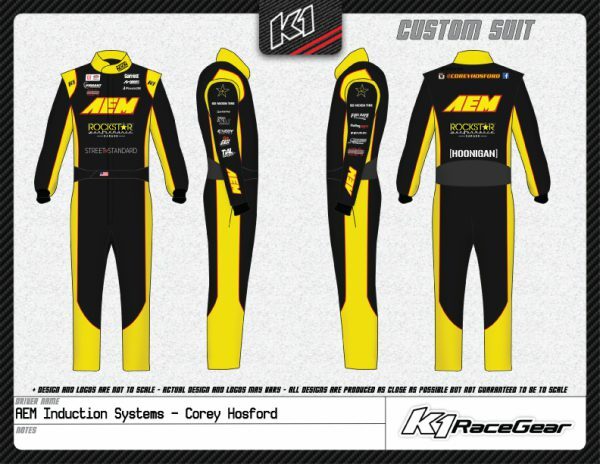 Rockstar Performance Garage and AEM Induction Systems have been pioneers in the automotive and racing community for years,” Hosford added. “If not for all of my sponsors, friends, and family…none of this would have been possible. I cannot thank them enough for their support and I am very eager to shred some Nexen tires in Pro2 this year. Gonna get rowdy!” he went on to say. The Bridges Racing championship team operate a top-notch facility in Huntington Beach that produces some of the meanest drift cars the world has seen compete in Formula DRIFT history. Bridges Racing has developed successful Formula DRIFT track cars for Daigo Saito, Robbie Nishida, Dean Kearny, James Dean, and Piotr Więcek to name a few. The Bridges Racing team principle is Bryan Bridges, a former NHRA Sport Compact Champ, accomplished championship Formula Drift team owner and all-around good guy. “Just looking at this car, you know it means business. So yeah, I’m super excited for the privilege to work with Bryan and the professionals at Bridges Racing. They have proven themselves on and off the track for years and it was an easy choice to work with them. It’s going to be an exciting season working alongside these guys!” Corey stated. The Nissan S14 Boss will be outfitted with a custom Pandem Wide V2 Body Kit and a stunning (NEW) yellow on black livery vinyl wrap that completes the exterior. Corey has kept very busy in recent years as co-founder of Street Standard; the Scottsdale, AZ based automotive retail startup that has found recent success through their website [www.streetstandard.com], offering high-end luxury automotive aftermarket parts, wheels and body kits. Corey also helped create and develop the popular podcast, Maximum Driftcast [www.maximumdriftcast.com] while boasting a huge following on Social Media too. So what does the future hold for Corey “The Boss” Hosford? “Right now, running a partial Formula DRIFT Pro2 season allows our team and myself to get our feet wet while heading back into the Formula DRIFT series. We have seen over the years, constant development in both the teams and drivers, and we feel this is what makes most sense for us to make a solid full return in 2018. I feel so lucky to have some of the coolest brands behind me to help pave the way to this future. I’m stoked to be back in the seat, and I can’t wait to blow apart some Nexen tires for all my friends and fans around the world,” Corey said. 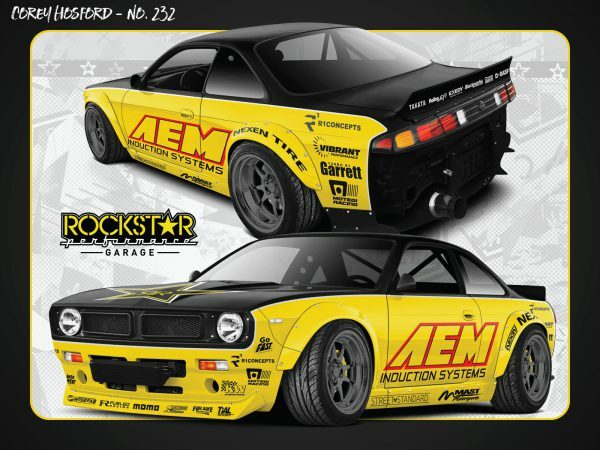 FUN FACT: The Rockstar AEM Nissan S14 Pandem “Boss” originally debuted at SEMA 2015 in the AutoMeter booth. “As much as I wanted to get this S14 build finished quickly, I knew that patience and attention to detail would set me apart from the rest – so I took my time building this one,” Hosford mentions. Previous Previous post: Twitter Chat with Vaughn Gittin Jr!